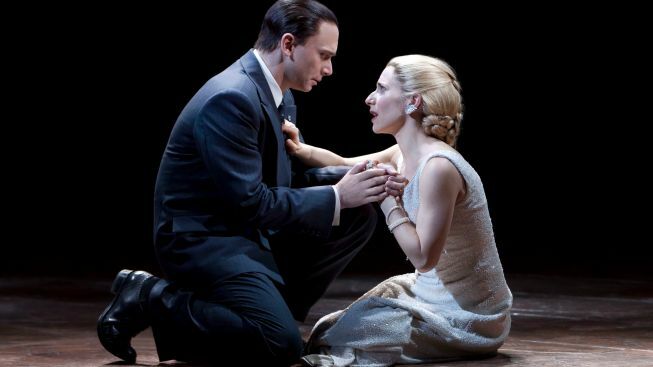 Michael Cerveris as Juan Peron and Elena Roger as Eva in "Evita"
Broadway’s “Evita” stars a lead actress from Argentina and a pop singer born in Puerto Rico. Then there’s Michael Cerveris, as three-time Argentine president Juan Peron. He's a native of Huntington, W. Va.
“When you’re performing with someone from Buenos Aires and someone who’s a Latin American pop star, there’s the fear you’re going to stand out as the gringo slicking his hair back and trying to pretend to be authentic,” says Cerveris, the five-time Tony-nominated actor (and winner, for 2004’s “Assassins.”) He's taken steps to avoid such an impression. Since “Evita” got underway, Cerveris has spruced up his Spanish (thank you, Rosetta Stone,) and spent a week in Argentina on a photo shoot with co-stars Elena Roger and Ricky Martin. He’s also kept a watchful eye on eBay in his hunt for all-things-Peron. Cerveris invited NBC 4 New York to the Marquis Theater to talk about how he keeps it real, as well as his recent encounters with ... let’s call it human frailty. Here are excerpts from the interview. NBC4NY: You’ve had a reputation as something of the Cal Ripken Jr. of theater because of your attendance record in shows from “Sweeney Todd” to “Road Show.” But last month, you missed your first performance in eight years, because of a delayed flight back from New Orleans. How did it make you feel? CERVERIS: I’d been living on borrowed time, because I’ve been flying on days off, in some instances out to Vancouver to shoot “Fringe,” and then flying back. I did that in the middle of press week (for “Evita.”) I had said no three or four times, but it was for the final episode of what at the time seemed like it might be the last episode of the series, so I relented, on the assurance that if for some reason all flights were shut down, they would send the Fox jet to fly me back to New York. It’s worked out every time. So I just assumed it always would. CERVERIS: LaGuardia just shuts down if there’s fog. Around Virginia, we started that circling thing, and as I was starting to wonder how long we could do that, they came on and said “We’re running out of fuel.” So we had to put down in Dulles, and I just had a sick feeling that once we were on the ground, we weren’t going to get back up in time. I warned our stage manager that the unthinkable was actually -- potentially -- going to happen... Life happens. I’ve accepted it... as much as I possibly can. Which is not completely. But there you go. NBC4NY: Now that you’ve been proven human, let's talk about that brace on your hand. CERVERIS: Oh. Well, I was playing in a charity softball game at Yankee Stadium. A ground ball took a weird hop and broke my hand. So I have to wear this during the show. We have a fabric sleeve to cover it, to try and make it as unnoticeable as possible... I’ve just been doing a lot of waving with my left hand, and shaking hands with my left hand. Peron’s a lefty, for the moment. NBC4NY: With Ricky Martin on stage every night, you’ve got this bilingual fan-base for the show. When audience members meet you after curtain, do they speak to you in Spanish? CERVERIS: Absolutely. It’s always daunting and slightly terrifying, because my Spanish isn’t fantastic, and under pressure, it’s ever harder. With all the noise after a show, it’s hard for me to understand English. But I feel a genuine desire to communicate to the extent I can. It’s bumbling, but sincere. Often, my Spanish and their English meet on a similar level. NBC4NY: How have you burnished your skills? CERVERIS: My family got me a Rosetta Stone Spanish (kit) for Christmas. I wanted to participate as thoroughly in the search for authenticity in this production, so even though I don’t speak Spanish in the show, I felt it was important to develop that out of respect for my colleagues. NBC4NY: It’s not just vocabulary lessons. You went to Buenos Aires for a week with them. CERVERIS: Elena was a fantastic guide to the city. She took me to late-night Milongas, where people get-together and dance tango starting at 11 or 12 at night. I went to an Argentine football match, Boca vs. Lanus, which is a big local rivalry. And then I also did a lot of research at the Peron Institute, with a guy who gave me the Peronist point of view on everything ... I think more important was his sharing the ideology and the social side of things, not just the political side, the ideas his party had about the Argentine people and what was “good” for the country. That helped me to argue Peron’s point of view in the story. Obviously, there are a lot of controversial aspects to his rule... (Director) Michael Grandage did not want to put forth any particular political agenda, but just try to let these people exist in all their complexity. NBC4NY: You’ve built quite the collection of Peron memorabilia. There’s a beautiful photo of Eva with her head buried in Juan’s shoulders in your dressing room. NBC4NY: Where did it come from? CERVERIS: That’s from the Peron Institute. And then I found some other remarkable things on eBay. This is the book the (Argentine Labor Dept.) issued to commemorate four years of what they had been accomplishing for the people. It’s got photos of the hospitals they built... The fantastic thing about this is, it’s autographed by him. NBC4NY: How much did it set you back? CERVERIS: One-hundred and fifty bucks. Which is kind of astonishing. There are some government documents online signed by (Peron) that are going for $3,000 or $5,000, so whoever owned this... well, he knew it was in there, because it was the selling point. But maybe he didn’t recognize what he had. And I have a couple of other things... A Peronist party membership book. Just being able to physically hold things that were actual elements of the time... I have a pin he wears in a lot of the photos I found, also from eBay. And I wear it in the show, on his suits, and that means a lot to me, that I have an actual “thing” from the time period.